During the Jurassic, the super-continent of Pangea continues to break apart. Volcanic activity associated with this rifting produced lava flows that poured out over mudflats and into lakes, producing the resistant rock that forms today's Watchung Mountains. 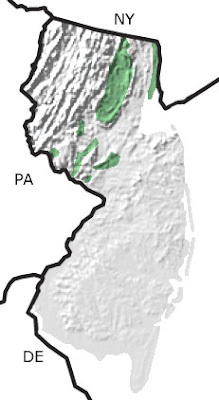 Molten rock intruded into basin sediments producing a sill, the Palisades Sill, and other ridges in Hunterdon and Mercer Counties. Bipedal dinosaurs roamed the basins during the Jurassic, leaving abundant footprints in the sediments layered among the lava flows. The Walter Kidde Dinosaur Park in Essex County boasts thousands of such footprints. Fossils of Semionotus, a fish related to the modern gar, are abundant in Jurassic lake bed sediments. This map indicates the presence of Jurassic rocks primarily in the northern part of the state. 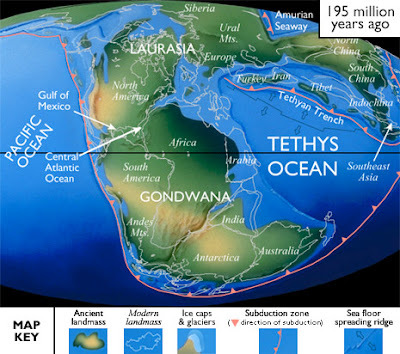 North American Paleogeography: As Pangea rifted apart, North America moved northwest during the Jurassic. The shallow seas that covered the interior of North America retreated to the western edge of the continent. The highlands that dominated eastern North America eroded and large dune deposits formed along the coast, which formed a narrow arm to the east of the modern Canadian Rocky Mountains. Subduction on the western edge of the continent caused frequent volcanic eruptions, forming the igneous rocks in the core of the ancestral Cordilleran.